During the past few days, as one might expect, we’ve been getting lots of news, reports, and files for the ransomware entitled WanaCrypt0r/WannaCry/WanaCrypt. First and foremost, the good news is that customers of PC Matic SuperShield were protected from WanaCrypt0r the entire time. 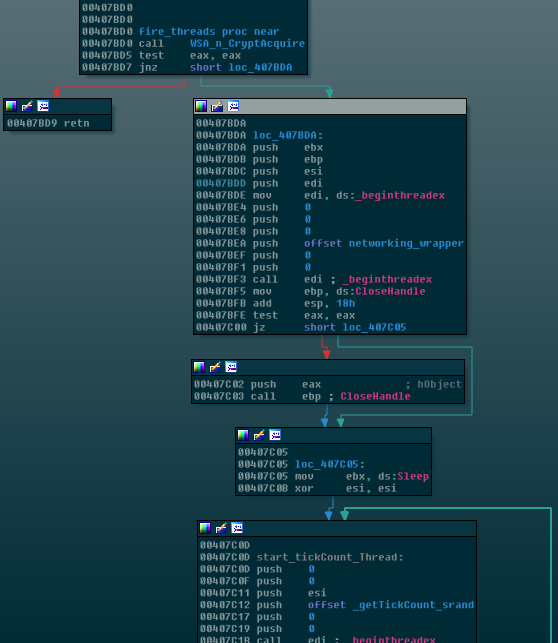 However, this post aims to provide a technical analysis of how WanaCrypt0r works, as it was clearly a threat to be reckoned with. The purpose of this post is to use the ransomware as an example to show malware analysts, enthusiasts, IT professionals, and the curious techniques that allow an attack like this to occur. At PC Pitstop, in addition to quality software, we stand behind quality training and education. One of the problems with classifying malware samples as “trojan,” “dropper,” “keylogger,” and other types is that some malware is essentially “all of the above” or at least exhibits behavior from more than one of these classifications. This is certainly the case with WanaCrypt0r. Technically, it could be labeled as ransomware, a worm, a dropper, and even a rootkit because it infects the kernel as well as user space. Due to this, we need to examine the overall mission that this malware appears to be trying to accomplish: Spread to as many computers as possible and encrypt files, asking victims to pay up to a bitcoin account. Due to the latter, WannaCrypt0r may be best described as a ransomware. Strangely, as of this writing, there are no public records of anyone who paid the ransom actually getting their files unlocked and while of course there is never a guarantee, unlocking files could actually help criminals remain in business and keep future victims paying. Upon execution, the victim’s data files on system and network drives are encrypted, as long as a “killswitch” website is not reachable. If the killswitch site can be connected to, WanaCrypt0r will not run. 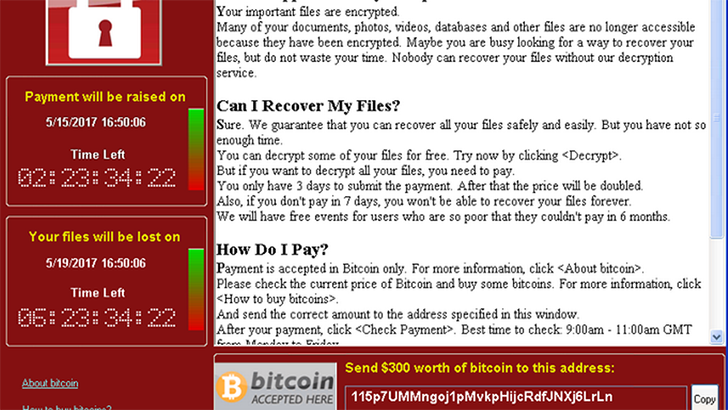 A ransom message is displayed, asking for payment of $300-$600 in Bitcoin in order for the victim to receive a decryption key and unlock his/her files. The original cost is listed as $300 but victims are told that this will double if the payment is not made after 3 days and after 7 days, the files will be lost forever. This behavior is very typical of most ransomware out there today, however one differentiating factor is how WanaCrypt0r spreads itself around networks by using an exploit called ETERNALBLUE which was released as part of the EquationGroup code leaks on April 14, 2017. Interestingly, this killswitch URL is placed front-and-center in WinMain(), the program’s entry-point. The author was apparently not concerned with a malware analyst locating this URL, despite the fact that it has the ability to stop the malware from executing the payload. 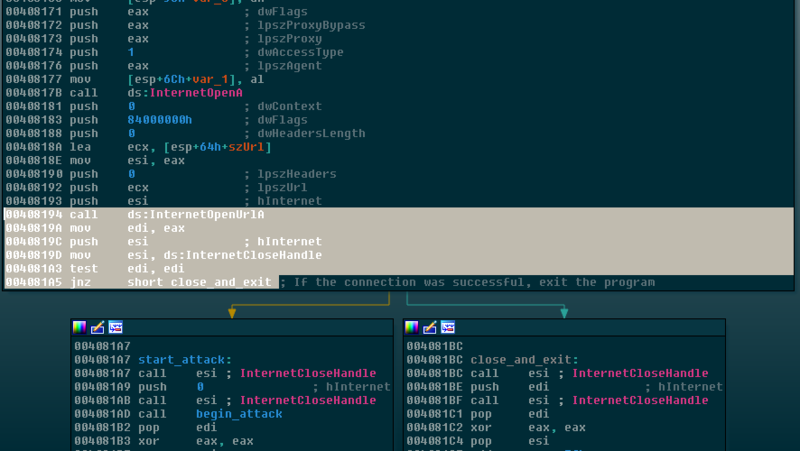 Finally, the program quits with ExitProcess if the connection was successful by using the jnz opcode. We modify the zero flag so that the program thinks the URL failed. As we see above, even though the resource is in fact encrypted, it is still recognizable visually and by the system as a proper Portable Executable file due to the first two bytes of “MZ” (4D 5A) as well as the appearance of bytes “50 45” (PE) later in the file. 727h is in fact 1831 in decimal, the name of the embedded resource. 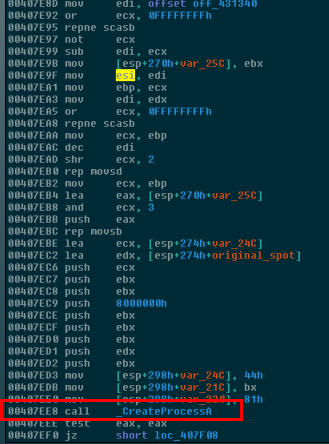 The actual executable that it runs at bootup is simply the main malware executable itself, but the service name has a 2.0 appended to it and this time, it is started with the commandline arguments “-m security” as seen above. Notice how after each series of instructions follows a mov _SomeCall, eax instruction. 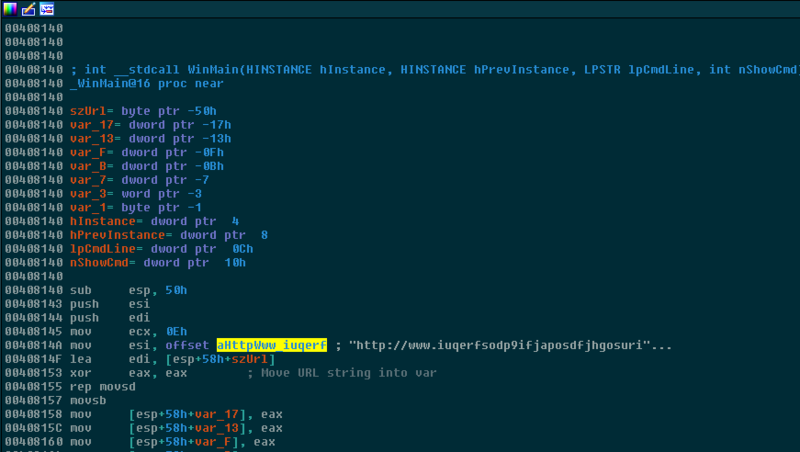 GetProcAddress is being used to grab the address of the function and store it in a variable at each of these movs. At this point, we can see the ransomware setting up a path of C:\WINDOWS\tasksche.exe and C:\WINDOWS\qeriuwjhrf and then calling MoveFileExA. This call copies C:\WINDOWS\tasksche.exe to C:\WINDOWS\qeriuwjhrf if it already exists. If it does not already exist, it simply writes the resource to the C:\WINDOWS\qeriuwjhrf path. This networking component is what contains the “meat” of the ransomware and what makes it unique. It utilizes the leaked EquationGroup ETERNALBLUE exploit which is demonstrated in Metasploit here. This exploit allows WanaCrypt0r to spread itself to all networked Windows devices which have not been patched with the MS17-010 security update. This update was actually released back on March 14th of this year, but as you probably know many individuals and networks do not immediately install all updates, leaving this vulnerability open. In summary, WanaCrypt0r first checks for a killswitch URL, then checks for commandline arguments and sets up a service which auto starts on bootup. 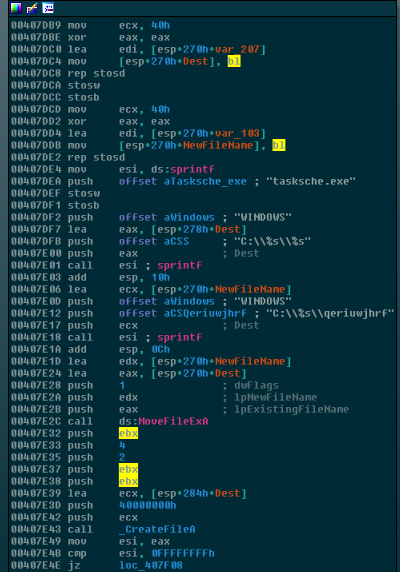 Once established, an attached executable resource file is dropped to disk and ran, as well as threads started which execute worm code that spreads the ransomware around the network via EquationGroup’s ETERNALBLUE exploit of the collection of vulnerabilities listed as part of the MS17-010 bulletin. In order to keep this from going on forever, we will end part I here. 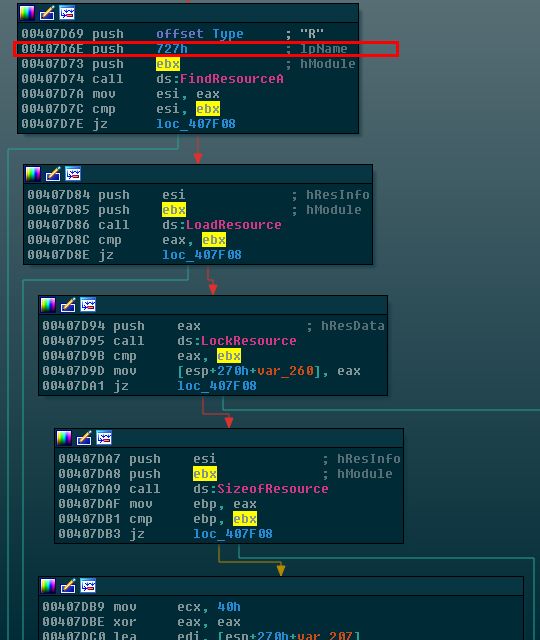 In the next part of this analysis, we will dive into the dropped executable and vulnerability code and also look at some of the compression and encryption used in WanaCrypt0r. Malware Research Team, Ransomware analysis, ransomware, wanacry, wanacrypt0r. permalink.